Bury Council provides nearly 38% of all home care visits in slots of just 15 minutes for elderly and disabled people. This high level of ‘short care’ visits, revealed by research by local Lib Dems, has been condemned by care charities like Leonard Cheshire and Trade Unions like UNISON. 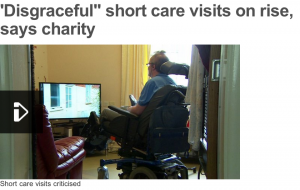 Leading charities, like Leonard Cheshire, have called for an end to 15 minute care slots. ‘Care workers are telling us that they cannot properly support disabled people to get up, to bathe, get dressed and to have breakfast in 15 minutes. This is not care. It is box-ticking. The situation has become critical. This is why we are going to stop bidding for 15-minute home care contracts, unless the person specifically requests a short visit, for example to receive medication. Find out more about Leonard Cheshire’s national campaign here. Trade Union UNISON have also joined the campaign nationally to end 15 minute care slots. There research show that 73% of councils in England, Wales and Scotland still commission 15-minute home care visits to elderly and vulnerable people. Home carers repeatedly raise concerns that elderly people are suffering because 15 minutes is not enough to provide even the most basic care. Frail elderly people cannot move quickly, making it impossible to carry out the range of tasks that often have to be completed in 15 minutes – feeding, bathing, administering medicines and getting people up or into bed. People with dementia find the rush of such a short visit particularly distressing. Care workers are also deeply concerned that they do not have time to talk to people in their care. This is especially worrying given that home carers can be the only source of social contact in an elderly person’s day. The impacts of loneliness on health and wellbeing are well documented. The rush of a 15 minute call also makes the risk of mistakes with medication higher, say care workers. UNISON is calling on the government to ban 15 minute care slots, and for councils to sign up to its Ethical Home Care Charter, which sets out basic standards for home care. The charter also provides guidance for councils to use in the commissioning process – 80% of homecare is provided by the private sector and paid for by councils. Find out more about UNIONS’s campaign to end 15 minute care slots. Bury Council last year provided 4790 15 minute care slots – nearly 38% of all care. Sometimes 15 minutes might be right for someone, as part of a proper package of care, but we don’t believe this applies to 38% of all care provided.